Anyone can apply for PAN card online who has not applied before. PAN Card is necessary to all Indian citizens for all types of financial transactions. Everyone needs PAN Card for opening a bank account or whether you are doing job, business or you are self-employed. PAN is Permanent Account Number issued by Income Tax Department of India for all Indian citizens who are tax payers. If you want to apply for PAN Card, then here are some simple steps, which will let you know how to apply for PAN card online. It is better to apply by yourself instead of hiring an agent because you will have to pay 50% extra charges if you apply through an agent. Open the official website of NSDL. 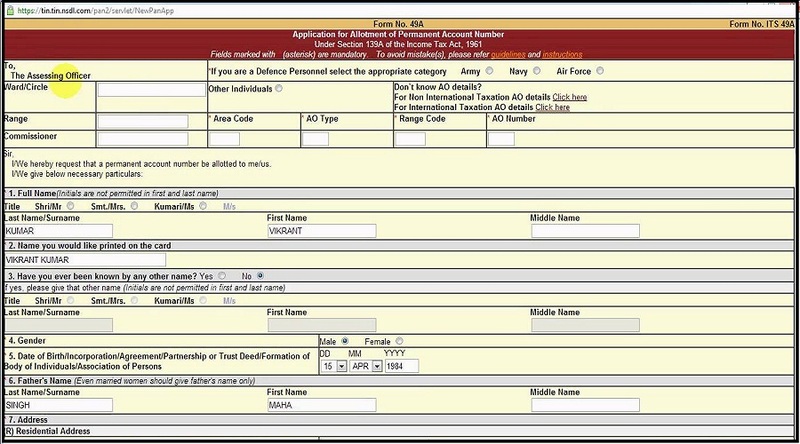 Click on “New PAN for Indian Citizens (Form 49A)”. Read the guidelines carefully and also read Do’s and Don’ts before applying. In the drop down menu select you desirable category such as if you want to apply individual select individual. To check whether you fill the form correctly or not click on Validation. After validation, you will get the 15 digit acknowledgement number. Now click on “Make Payment” and you will get the success message. Take the print out of it. Affix your two photographs of the size of 3.5×2.5 cm. Photographs should be attested by yourself. Signature on the space given for signature on the both pages of the form. Indian citizens have to pay Rs. 105 and for NRI’s fees is Rs. 971. NDSL provides two options to payment one is online and another is offline. If you want to make payment with online mode, then you can use credit card, debit card or online banking or if you go through offline mode, then you may use demand draft and cheque. PAN card, typically used as an identity proof, is necessary to be quoted while opening bank accounts. Without a PAN, you will not be able to carry out any monetary transaction. Applying for PAN card online is easy. The procedure is simple and if you have all the documents ready then you can easily complete the process in two days where in you will also get your acknowledgement number in that time period. Applying for PAN card online is easy. The process is simple and if you have all the documents ready then you can easily complete the procedure in two days where in you will also get your acknowledgement number in that time period.